UFO sightings are a daily occurrence for MUFON, the Mutual UFO Network, and the organisation is always on alert for more alien encounters. Here are some of the most bizarre eye-witness accounts of UFOs. The Mutual UFO Network was established in 1969 and has since grown to become one of the world’s largest bodies of dedicated UFO hunters. MUFON’s goal is to study, track and gather data on daily UFO encounters from around the world. The bulk of MUFON’s work relies on user submitted reports which the organisation claims to meticulously review before publishing. 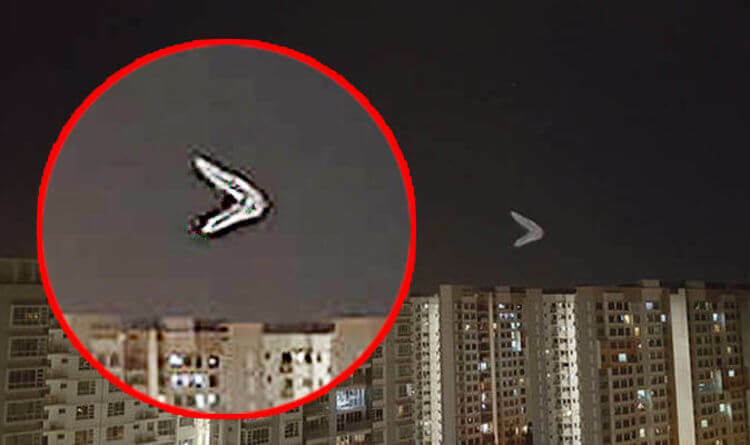 One of the more recently published UFO sightings, submitted by a witness in Singapore, concerns a “fast moving, boomerang-shaped” object in the sky. The UFO was seen dashing across the sky under cloud cover on October 6, 2017. The eyewitness recounted in Case 87184: “It was a very clear and cloudless night when I looked up and saw this boomerang-like, ‘cloud’ flying by. The witness estimated the object was roughly 2km away from their position but managed to cover the entire distance along the horizon in “just a mere couple seconds”. The witness stressed the UFO was moving to the east – against a northeastern wind. MUFON researcher Robert Spearing has since closed the case as an Unknown UAV, or unmanned aerial vehicle. Thousands of miles away in North Las Vegas, US, a witness submitted a report of what appeared to be a teardrop-shaped object flying some 500 feet above the ground. The MUFON testimony claims the witness was outdoors shooting photographs of airplanes landing at Nellis Air Force Base in southern Nevada. The testimony reads: “The UFO is too far away, about two miles, to say what it was. It was like a bright light, but when I blew it up, it looked like a smoky goldfish cracker. “I blew it up to about 200 percent and it looked like a cloud of circular smoke. I probably don’t have the best equipment to say what it was. “And with so few pixels, well, we don’t have enough solid evidence other than its descending path, which can be calculated by time to say, yes this was a UFO. But the object started up at 1,000 feet and pulled a 45-degree descent. Nevada MUFON State Director Sue Countiss closed the case as an Unknown UAV. The next case presents another oddly shaped object floating over a city but this time over Angeles City, northeast of Manila. This UFO was spotted by a “trained US Marine observer” who was sipping a cup of coffee at 5.45am local time on May 1, 2017, during the encounter. The witness said in their report: “I heard my dogs carrying on outside and went to investigate. “At first, I thought they had barked at nothing, when I suddenly caught sight of the object. The case was investigated by Chase Kloetzke who closed it as an Unknown UAV. A California witness claims to have seen a triangle-shaped object with seven, blinking lights pass over Fresno, US. The UFO encounter took place on April 26, 207 around 9pm local time. The eye-witness recollected: “I looked up in the sky and saw a triangle-shaped craft with seven white lights blinking all at the same time heading west. “It was very clear and seemed too large to be an aircraft. “I thought it might be a drone at first glance. But it was too large and too high in altitude to be a drone. The case was closed for MUFON by field investigator Hady Felfly as an Unknown UAV.